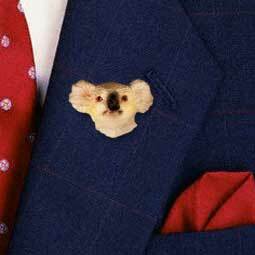 The Koala lives in Australia, and rarely leaves the eucalyptus trees they eat the leaves from. They sleep during the day, sometimes up to 18 hours and feed at night. Each Koala eats about 2 ½ pounds of eucalyptus leaves a day and get their moisture from the leaves as well, so they barely drink water. They eat so many of the eucalyptus leaves that they actually smell like the leaves. Many people mistakenly call the Koala a “bear” when in fact it is a marsupial, or “pouches mammal”. This means after their young are born, they develop and grow inside the mother’s pouch for the first six months of their lives, after that, they and will stay with their mothers, riding on her back or clutching onto her belly until they are about a year old. The average life span of a Koala in the wild is 20 years and they weigh approximately 20 pounds. The Koala is a herbivore, eating only vegetation, no meat.